Heavy Duty Steel Flush Entrance unit with welded frame. Complete with a commercial grade ball knob entrance lockset and spring hinges in a prime coat finish. Equipped with a 90 min fire and smoke label. Manufactured with the highest quality Galvanneal Steel which looks like RAW STEEL but it actually is Mill primed and ready to paint once cleaned. Frame is installed before the wall is built and comes complete with combination anchors for either NEW masonry or NEW drywall applications. Masonite's 6 Lite craftsman, Low-E glass units are made with tempered glass, dual-sealed for insulation and comfort. Our high-quality steel entry door is sure to suit your design and performance requirements. The high-definition panel profile provides excellent shadow lines, creating outstanding panel definition. For added value this door is insulated with a polyurethane core, providing an energy efficient entry system recognized by ENERGY STAR. This unit comes double bored making it ready to accept a lock set and deadbolt and has been factory primed, ready to install. 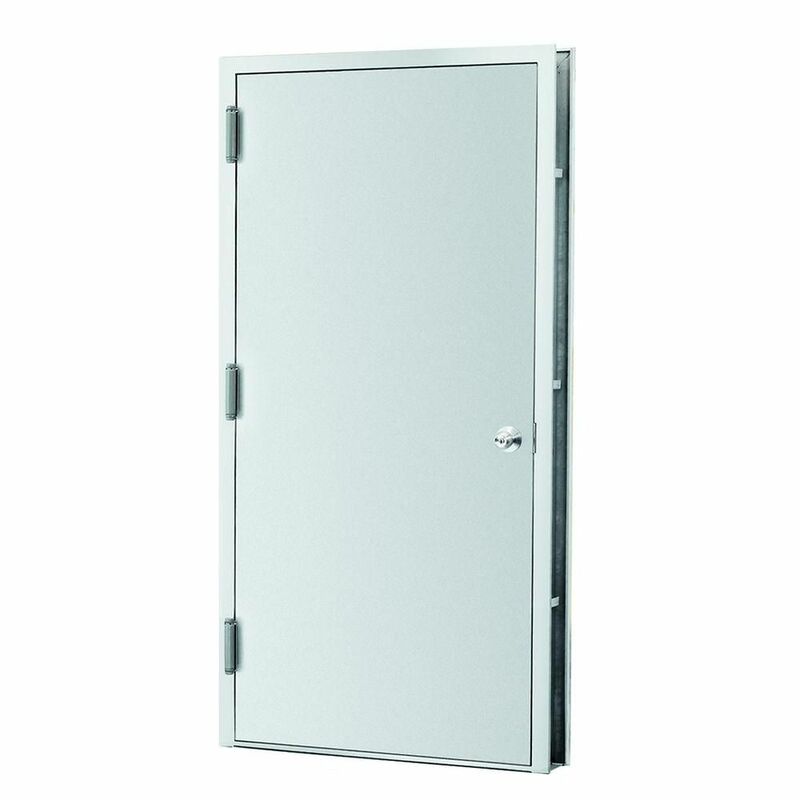 Compliment your modern style with the Masonite 1 Lite Steel Door. Sqaure, clean lines and sleek finishes set the tone for modern design while adding ultimate security. Expertly engineered, the wood-edge design features an energy saving door core adding strength and insulation. Ready to customize and paint, the baked-on primer helps create a durable, smooth finish. 36x80 Steel Pre-Hung Unit L.H - ENERGY STAR® Heavy Duty Steel Flush Entrance unit with welded frame. Complete with a commercial grade ball knob entrance lockset and spring hinges in a prime coat finish. Equipped with a 90 min fire and smoke label. Manufactured with the highest quality Galvanneal Steel which looks like RAW STEEL but it actually is Mill primed and ready to paint once cleaned. Frame is installed before the wall is built and comes complete with combination anchors for either NEW masonry or NEW drywall applications. 36x80 Steel Pre-Hung Unit L.H - ENERGY STAR® is rated 3.9 out of 5 by 10. Rated 5 out of 5 by Mike from Great door for the money.You need to spend some time... Great door for the money.You need to spend some time cleaning before painting, with the mill finish on the steel.Door and frame were straight and true. Rated 1 out of 5 by HomeDepotCustomer from Did not come with keys for door. ... Did not come with keys for door. Rated 3 out of 5 by HomeDepotCustomer from should provide with deadbolt option, scratch the handle, just do... should provide with deadbolt option, scratch the handle, just do a double bore. Rated 1 out of 5 by Lakeesha from I'm unable to give a rating at this time being... I'm unable to give a rating at this time being that we were not able to install the door. It was too short so we ordered the 36" x 84". Expected delivery date is January 8th - 12th. Rated 5 out of 5 by Oldracer from Door exceeded my expectations. Solid, easy to install and looks great too. Door exceeded my expectations. Solid, easy to install and looks great too. Our in store and On-line frames are made for a 4-3/4&quot; wall. They are designed for a 2x4 Stud wall with a single layer of 5/8 sheetrock on both sides of the wall. The frame size you are referencing for a 2x6 wall is available as a SPECIAL ORDER. Please visit any local Home Depot store and see the Millwork Dept. for details. 1. How many of the hinges are &quot;spring hinges&quot;? Do they conform to CAN/ULC S133? 2. Do both the door AND frame have fire rated labels? Do they conform to CAN/ULC S104? I'm not sure what CAN/ULC S133 is but I can tell you that all of our Doors Units have been tested by WARNOCK HERSEY which is one of the largest FIRE RATING test agencies. All of our In Store Stock Units come with 2 Spring Hinges and 1 Ball Bearing Hinge which is perfect to correctly self close the door. The Door comes with an Hourly fire rating label and the frame comes with a fire label that is embossed into the Steel frame between the first and second hinge cutout. There is NO hourly rating on the frame only the door due to the fact that the frame picks up the hourly rating of the wall.....If you have any further questions you can call us @ 516-390-6800. Ask for the Home Depot Dept.